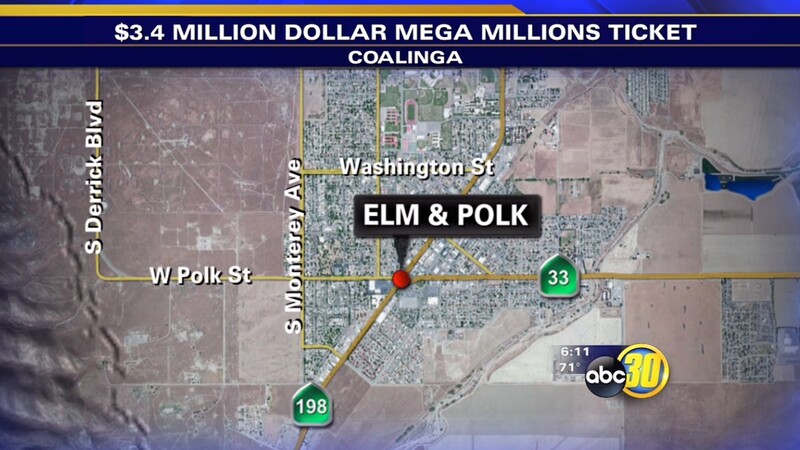 FRESNO, Calif. (KFSN) -- We have a new millionaire in the Valley after someone purchased a winning Mega Millions ticket in Coalinga. A ticket matching five of the six numbers (4, 74, 44, 20 and 65) in Friday night's drawing was sold at the Ice Bucket III - Chevron store on Elm Avenue near Polk Street. Only the Mega number 14 was missing -- making the ticket worth a whopping $3.4 million. The store itself will receive a bonus of $17,000. No one scored the $74 million jackpot, so the pot will increase to an estimated $88 million for Tuesday's drawing.